"95 is on the field! Quick, snap the ball before they change their minds!" Prior to the Philadelphia Eagles' 2015 season, Mychal Kendricks signed a four-year contract extension worth $29 million. At the time, in his previous 16 games -- the final four games in 2013 and the 12 games he played in 2014 -- Kendricks racked up 115 tackles, 7 sacks, 5 forced fumbles, and 2 interceptions. He now looks nothing like the player Cris Collinsworth fawned all over on Sunday Night Football once upon a time. 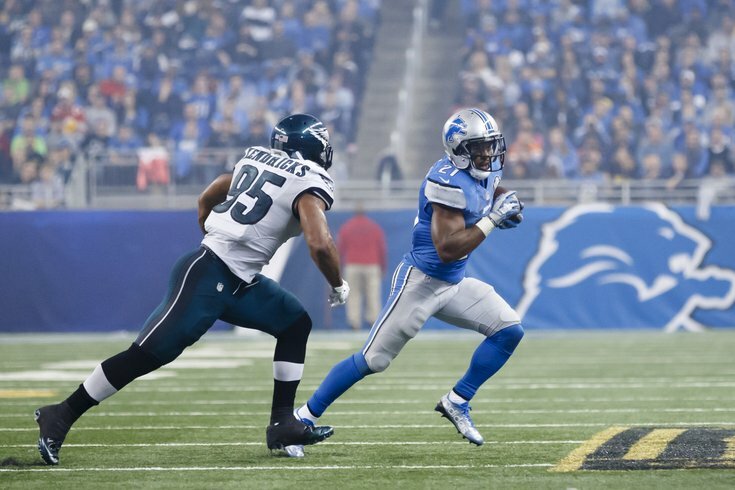 Against the Detroit Lions this past Sunday, Kendricks was a hot mess. In total, he was on the field for 26 snaps, three of which were kneel downs. It just felt like a lot more than that because he had so many bad moments. It started off on the first drive, when the Lions found the matchup of Theo Riddick vs. Kendricks that they took advantage of all day on Thanksgiving a year ago. Riddick was Stafford's first read on this play, which the Lions executed with ease. That's like taking candy from a baby, and really, it's a matchup that Jim Schwartz probably should have known the Lions would look to exploit. The next five plays we'll show were all on the Lions' third drive of the game. This first one is egregiously bad football. Riddick gets 10 yards, the Lions go for it on fourth down, and get it. Drive continues. Brutal. The Lions get 13 on that play on 2nd and 10. Once again, on the same drive, Kendricks makes the wrong read. On this play, he has help to the inside, and should be forcing the play back toward the middle of the field. Instead, he tries to avoid the block to the inside, where he and Malcolm Jenkins collide, opening up a lane to the outside. Jenkins screamed at Kendricks after this play. This should have been a two or three yard gain. Instead, the Lions get eight down to the one-yard line. Opposing offenses are going to easily identify Kendricks as the weak link on the Eagles' defense, and try to attack him with regularity when Jim Schwartz puts him on the field.